Pure Hemp Botanicals is as passionate about making whole-plant hemp products as we are about fostering compassion in everything we do. Our mantra, “Compassion in Action” guides our work and relationships. We serve a growing community of evolving hearts and minds to produce sustainable, plant-based, vegan, and cruelty free products, while seeking to raise awareness about, and inspiring others to adopt an attitude of compassion. With compassion at the heart of our business, we’re happy to give back to like-minded organizations who utilize the ethical, eco-friendly business practices that respect all the earth’s inhabitants. This is the reason that we’re so happy to support Mercy for Animals, an organization that works to educate people and companies about compassionate food choices and ways to improve the welfare of farm animals. Pure Hemp Botanicals donates 1% of every purchase to this incredible organization in an effort to live out our mission of showing our compassion in action. 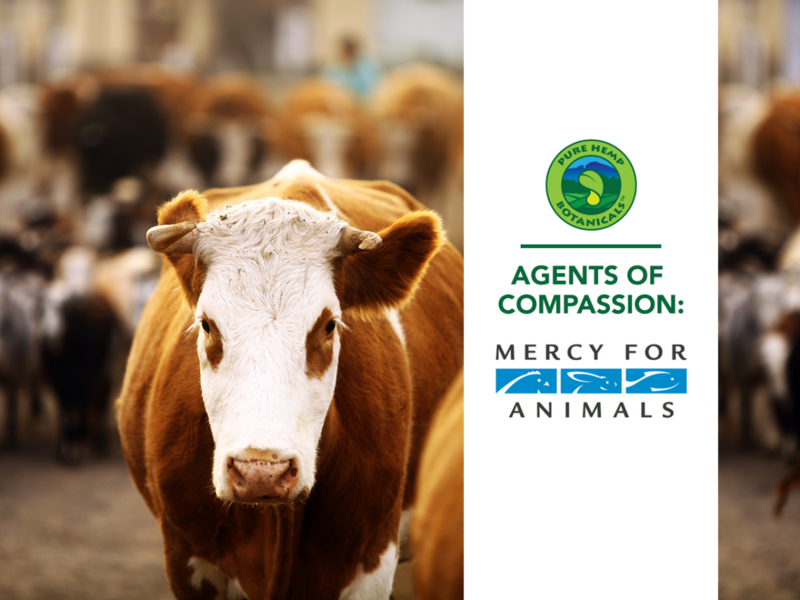 Mercy for Animals is a nonprofit organization dedicated to working hard to improve the living conditions of farm animals like chickens, cows, and pigs. By informing the public about inadequate farming practices, they are not only spreading compassion, but saving the lives of many animals in the process. 15 years ago, Mercy for Animals was born after their president Nathan Runke learned about inhumane farming practices and discovered that this type of treatment was the norm across the United States. What he found on further investigation inspired the mission behind Mercy for Animals. Their agents of compassion have played an instrumental role in transforming hearts and changing laws. Today, Mercy for Animals is an award winning nonprofit organization that was named “one of the top three most effective animal charities in the world” by Animal Charity Evaluators and one of the “15 Top High-Impact Nonprofits” by Philanthropedia. They have earned this recognition because of their tireless work to prevent cruelty to farmed animals. They also promote compassionate food choices and policies through undercover investigations, legal advocacy, corporate outreach, and educational programs. Their investigations played an integral role in outlawing cruel confinements in California and Ohio. Their advocacy led Nestlé, the world’s largest food company, to commit to improving the welfare of the animals raised for their products in 90 nations around the world. It is estimated that more than 50 million animals have benefitted because of their many corporate policy victories and the new laws they have promoted. Their educational programs, online campaigns, and television ads have saved animals lives as well, by inspiring hundreds of thousands of people to pledge to become vegans and vegetarians. Approximately five million animals have been saved because of the thousands of people that have been inspired to eliminate or reduce their consumption of meat, as a direct result of Mercy for Animals’ advocacy efforts. We love when we have the opportunity to empower other people who share our commitment to putting compassion into action, and we’re proud to support Mercy for Animals.